Here are some to try – these first four plants are smaller and can be planted together. The fat leaves of this hearty sedum need very little water. Just give them a sprinkle to avoid shriveling. This plant looks spectacular in vertical planters that are popular right now. Its tight and mounding growth pattern keeps it nestled into the growth medium. The numerous spectacular flower-like rosettes of black-burgundy leaves are a perfect foil for light colored plants. Bright yellow flowers appear in winter and the strong stalks on which the rosettes appear can rise to several feet in its height. This eye-catching chartreuse plant is a vigorous grower with a mounded to trailing growth habit. Its spiky foliage has a spread of 12-24 inches and an optimal height of just three to six inches. This compact plant is one of the most attractive of the smaller Agaves. It grows a single, very symmetrical rosette, about 12 inches tall by 15 inches wide. The upright, one-inch wide blades are a mottled gray-green color with dots of burgundy. These next three plants are large. With regular pruning, they can share space with other plants in a container. Alone in a large pot, they will produce a big, showy plant. The blades of this plant grow about two inches wide and are green edged in red. It will grow up to five feet tall. 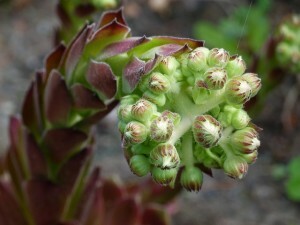 In hot summers, it features a spike of tubular, red flowers from the center, followed by sturdy seed stalks. This flax grows well under full sunlight or partial shade. This container-friendly shrub has lush gray-green leaves. Pale yellow fragrant flowers emerge in late fall to early spring. Left untended, it will grow to up to 12 feet tall and 15 feet high. The Woollybush hails from Western Australia. This shrub gets its common name from the dense, blue green foliage with red tips. This sun-loving plant can grow three to six feet tall and spread four to seven feet wide. Tended in a container, it is a trailing plant that balances taller plants. I like the idea of having some potted plants in my home, but I didn’t know what plants would be able to flourish under such circumstances. I like the sound of planting some lemon coral, as well as some mangave. I also think I’d like to try for some willow wattle. Thank you so much for these ideas!